Departure Dates: This tour is offered all year round. Price Excludes: International airfare, airport/departure taxes, gratuities, optional excursions, travel insurance, visas. Visa is required for Suriname. Transfer from the hotel to CJI airport, Guyana for your flight to Paramaribo. Transfer to your hotel Krasnapolski for 2 nights. 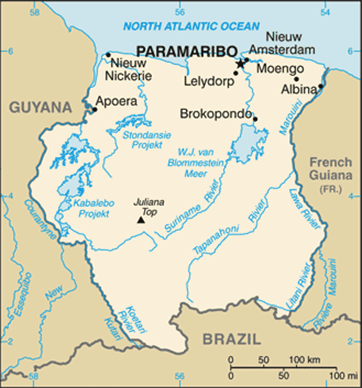 After breakfast take a city tour of Paramaribo. Lunch in a typical Surinamese restaurant. Dinner and overnight in a Paramaribo hotel. After breakfast we will be taken by bus to Brownsberg Nature Park. On the way we may pay a visit to the village of Nieuw Koffiekamp and the goldfields. Overnight stay in one of the cabins on the Mazaroni Plat in Brownsberg. Hike to the Irene or Wittie Creek. Visit Affobaka, Brokopondo. By dugout canoe to the lake. Activities include fishing for piranha and tucanari. Departure to Paramaribo by bus. Overnight and dinner at hotel in Paramaribo. Transfer to Guyana for return flight.